Home > News > To cooperation with new partners! University’s Principal, prof. Ruslan Postolovskyi, the first Vice-Principal prof. Roman Pavelkiv, Vice-Principal for academic, pedagogical, educational, and methodological work prof. Iurii Pelekh, Head of the Department of International Relations Pavlo Antoniuk-Kysil confidently work for extension of partners’ contacts of Rivne State University for the Humanities abroad. On the 27th March 2018 the Agreement about the Cooperation was signed during the formal visit of Bulgarian delegation headed by Gesho Lyubenov (President of Tural Management Company). Now Bulgaria is the country that is included in the list of RSUH abroad partners. Within the Agreement having the possibility to train in Bulgaria students can also study at Varna Free University, one of the most powerful universities of the country, where the studying is provided according to 35 specialties. 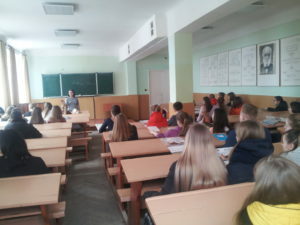 Company’s members have already met with students of Psychology and Natural Sciences Faculty (the dean is Vitalii Pavelkiv) and presented the prospects of training in Bulgaria. We hope for effective cooperation and successful realization of planned aims.